The early P-40 was basically an attempt to take a known quality, the P-36, and make it faster. To do so, they used the same flight surfaces as the earlier plane and modified the fuselage to accept the Alison V-1710 twelve cylinder water cooled engine. The displacement of this power plant was actually less than the P-36s R-1830, however, it was generally easier to extract more horsepower from a liquid cooled in-line engine and this engine lowered the frontal area of the plane increasing its ability to slip through the air. Curtiss had been in cahoots with the US Army Air Corps for years so it was not surprising that the type found favor with the brass and was soon put into production. It was considered to be a 'hot ship' by many of the pilots who flew it and so for a period of time, was the darling of the Air Corps. However, when compared to what was fighting in the skies above Europe at the time, it was not all that great. The plane was pretty much an average performance in all flight regimes except for the dive where its weight and strong construction allowed it to excel. Such was the strength of the type, that the British (who were really rather desperate for anything bordering on a modern aircraft) bought a number of them and used them in North Africa where the general quality of the opposition was lower. They were also exported to China who were also rather desperate for modern fighters in their war against China. China also needed quality pilots as they simply did not have all that many. 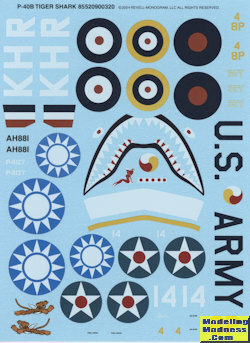 It was into this atmosphere that the Flying Tigers were borne and while they saw no actual combat until after the war started, they were flown with skill by seconded US military pilots against seasoned Japanese opponents. Though the Flying Tigers get most of the press for the early P-40, it was the British in North Africa nearly a year earlier who first took the Curtiss fighter into combat. The P-40 was able to keep up with Italian and German fighters when flown by skilled pilots, who appreciated it heavy firepower and strong construction. The P-40 was always a low altitude fighter thanks to its un-turbocharged engine, so it was used as much for ground attack as it was for offensive fighter operations. Such was the pace of the war that the P-40B/C was considered obsolete by late 1942 and relegated to training or other secondary roles. 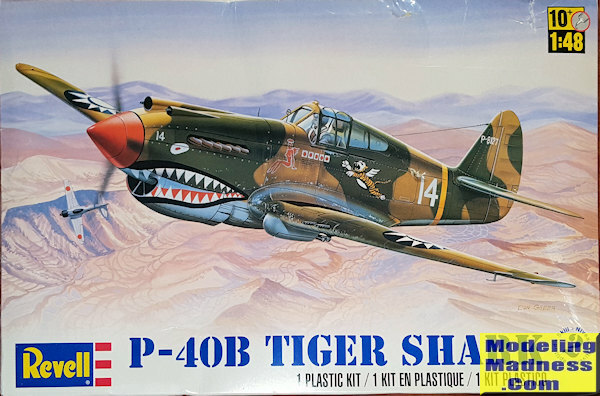 It is surprising to the many fans of the early P-40, that despite numerous attempts in this scale to produce a definitive kit of this plane, so far the Monogram version from the Jurassic is still the most accurate around. Even the two new 2016 releases by Airfix and Bronco apparently have their issues. According to the embossing on the inside of the wing, this is a 1964 initial release so you have an idea of how long other companies have been trying to beat it. Despite its age, this particular release is still very nicely molded. There is not the mass of flash one would expect from a tooling this old, making one wonder if Revell cut replacement tooling using the old molds. Unlike some older Monogram kits, this one has an interior of sorts with some detail on the inside of the fuselage halves. There is a seat to which one attaches the control stick and the pilot. This and the flap handle attach to a floor piece. An instrument panel attaches to the inside of the fuselage and pins on the floor fit into sockets on the right fuselage half. After one glues the fuselage halves together, there is a nose piece that includes the radiator intake and the front of the gun fairings. The aft fairings are then attached. The last time I built this kit (which was the 1980s), I recall this nose piece not fitting all that well. There is a prop shaft that attaches to the back half of the spinner that should be assembled prior to adding the nose. Tailplanes are single pieces and each side has three large ejector pin marks on the underside. There is a tail gear housing that incorporates the doors into which a swivelable tail gear is attached. The kit has separate flaps that can be posed lowered, though there is nothing in the upper wing to prevent you looking all the way through the cockpit! There are hinge pieces that attach to the lower wing to hold these in place. Landing gear consist of a strut and four piece wheel assembly. There are two tire pieces that are then trapped between wheel halves. This is to allow the wheels to roll. 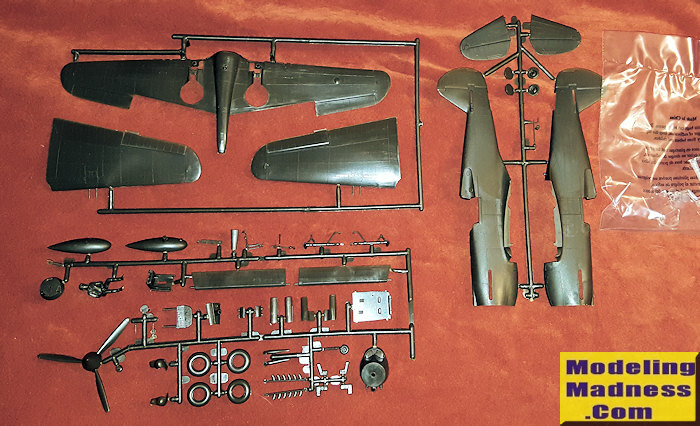 THe kit offers both single piece closed clear bits and four piece open clear bits. On the bottom of the fuselage fits a drop tank which is held to the bottom of the wing by a large pin. Instructions are well done and the current style with generic and FS595 color info. Markings are unchanged over the decades and offer an 8th PG plane which is really rather boring. Then a 403 Squadron RCAF plane coded KH*R in RAF colors. Finally he box art flying tiger which apparently has the wrong aircraft number for 'Hell's Angels', the 3rd squadron of the AVG. The decal sheet is well printed and there have been a lot of aftermarket sheets printed over the years that will fit this kit. As a note, I'm pretty sure the fuselage band and letters for the RCAF option should not be white. It never ceases to amaze me that a kit of this vintage is still the most accurate in outline over anything yet produced. It can be found on the cheap, is fairly easy to build and thanks to Starfighter Decals, a Medallion Models cockpit set is available to help what is the weakest part of the kit. Now, Revell needs to toughen up their boxes. I ordered this from Amazon who promptly put it in the bottom of the shipping box, piling other heavier things atop it. Results: several holes punched in the box and a rather wrinkled presentation! My thanks to me for picking this one up.